Glaze Meadow's 4th hole is a superb dogleg right Par 4. You may not have been aware of this at the time, but 'Jungle Bird' - the fool that disrupted the US Open trophy presentation on Sunday - was actually attempting to make a political statement. Jungle Bird, aka Andrew Dudley, is a bit of an activist at heart and, by making strange bird sounds over the voices of Bob Costas and champion Webb Simpson, was conveying the notion, I think, that exotic birds are losing their habitats because of deforestation. I certainly don't want to make light of that situation because, though his methods are a little inappropriate, Dudley is probably right. But if he plays golf, I wonder if he'd drop his anti-tree felling stance for a moment after seeing what the loss of some trees has done to the Glaze Meadow course at Black Butte Ranch in Sisters, Ore. Approximately 600 trees were removed from the Lake Course at Olympic ahead of the US Open. At Glaze Meadow, roughly five times that number came down. And for those that knew the course prior to the renovation, the transformation is astounding. There's no doubt, Glaze needed it. Just 32 years after it opened, it had become clear the Gene Mason-designed course was not standing the test of time terribly well, becoming excessively narrow and increasingly claustrophobic. There was simply too little space between the trees for resort golfers to enjoy themselves, and better players could no longer hit their driver as the ball would invariably run through the fairway and into the woods. Views of the Cascade Mountains were blocked by the timber. The irrigation system was becoming seriously out-dated. And despite the best efforts of the resort's superintendent Phil Lagao, the small greens were difficult to maintain. 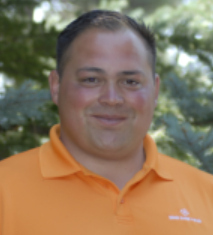 "We had major issues with the greens because the irrigation system was no longer efficient and many of the surfaces were constantly in shade," says Lagao. "It usually took until the middle of July to get them rolling well because the turf didn't come out of winter in a healthy state. It didn't handle the snow and ice particularly well, and we had a lot of thin spots where the turf just wouldn't grow. To be honest, we always felt like we were fighting a losing battle." As a result, Glaze Meadow was becoming less and less popular by the season. 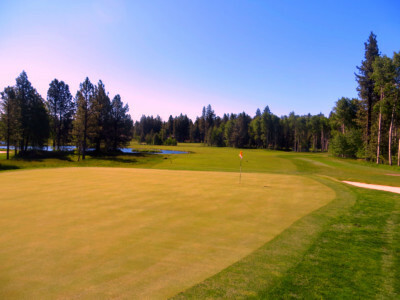 While the resort's original layout, Big Meadow, designed by Robert Muir Graves in 1975 and updated by Graves's associate Damian Pascuzzo four years ago, continued to attract acclaim and good business, Glaze Meadow lost golfers by the cart-load, recording just 13,000 rounds in 2009, almost 66% fewer than in 2005. Six architects vied for the renovation project with native Oregonian John Fought winning out. The snipers assumed foul play as Fought's brother Jeff is the resort's Director of Golf, but it's unlikely the competition was as eager to get their hands on Glaze Meadow as Fought who insisted he could make the course '300% better'. "I was aware of the problems the course had been facing for several years," he says. "And I knew how special it could potentially be." 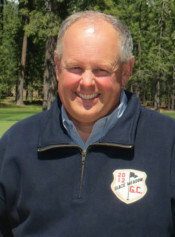 Fought got to work in September 2010 with $3.75million at his disposal, money he used to make several significant changes to a course whose popularity rating is now surely set to soar. "I didn't change the original routing, but the course now is barely recognizable in some places," says Fought. "We built 18 new greens, new tees, and new bunkers. We changed the turf on the putting surfaces from Poa to T-1 Alpha Bent. We took out about 3,500 trees to widen the playing corridors and let the sunlight reach the grass, improving the drainage and the health of the turf." The most notable changes come early with the 1st hole changing from a bizarre 'S'-shaped Par 5 with trees in the middle of the fairway to a shortish Par 4. The trees in the fairway and those behind the green have been cleared, allowing everyone to hit a driver off the tee and also see the water feature in the distance, water that had been concealed for years. The 2nd is now a fine Par 5 instead of a mediocre 4, and the 3rd a superb short Par 4 with water in play all the way down the right. And with so many trees gone, the hole is far more exposed to the wind which can make clubbing the approach shot especially tricky. The 16th is another hole that Fought considers a dramatic improvement. "It was so narrow before," he says. "We must have widened the gap between the trees by 40 yards or more. And, as is the case on most holes now, there's rough on each side of the fairway to act as a buffer for balls that previously would have run into the forest." Because of the number of trees Fought removed, he quickly earned the nickname the 'Tree Killer' and had a tough time convincing some of the resort's homeowners he was doing the right thing. "I knew I'd be unpopular at the start," he says. "No one likes to see trees being cut down. But we performed the job carefully, and were able to explain to homeowners why we felt the need to cut down so many. When we showed them the results, they soon saw that the course was now going to be much more fun to play, and definitely better conditioned." Feedback from the press, homeowners, and resort guests who have previewed the course, has been universally positive up to now, but no one is more excited about the new-look Glaze Meadow than Phil Lagao. "I'm very excited about the changes," he says. "We're still growing-in the new turf right now, but already it is so much more consistent. It will make my job a lot easier, and I estimate we'll be able to cut water usage by 20%-30%." Yes, a few trees may have disappeared in the remaking of Glaze Meadow, but reducing water consumption by tens of thousands of gallons every year has got to be good news for even the most dogmatic of environmentalists. Jungle Bird might even approve. Glaze Meadow officially re-opens on June 30th. 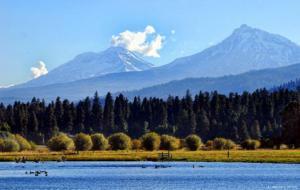 Black Butte Ranch; nice location. Central Oregon, focused around the cities of Redmond, Sisters and Bend, is really the perfect long weekend ( or week-long) destination for Bellinghamsters. About eight hours away by car, it's certainly too far for a day trip and you might not want to set out late Friday afternoon or early Saturday morning if you need to be back at work on Monday. If you have the extra day or two though, the drive isn't so bad and can be cut up with stops in Seattle and Portland. And once you get into the Cascades and on to the Santiam Highway, the scenery is fantastic. Black Butte Ranch is a beautiful 1,800-acre resort about eight miles north-west of Sisters that offers homeowners and guests a good variety of activities (swimming, golf, horseback riding, kayak rentals, biking, hiking, river rafting tours, fishing) and lodging options ranging from basic lodge rooms to condominiums to large single-family houses. Golf specials are available starting at $99 per person per night, and include accomodation in lodge rooms at the lodge condominiums, unlimited golf and unlimited range balls and cart use. A two or three-night minumum stay is usually in effect.